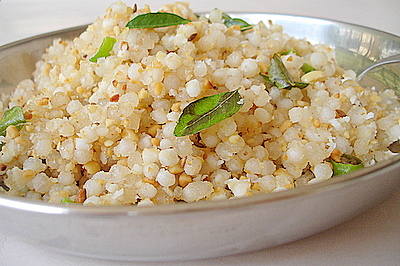 Sabudana khichdi can be served as a snack or as a part of main course. It is also favored as a fasting food. Soak sabudana in ample water for 4-5 hours till it is soft. Sieve. Roast the peanuts and grind them to form powder. Keep aside. The peanuts prevents the sabudana from sticking and forming lumps. Heat oil in a pan. Add mustard seeds, hing and cut green chillies. When mustard seeds start to pop, add the sabudana, peanuts, red chilli powder and salt. Stir properly and cook on low flame for 7-10 minutes. Take it off the flame and add lemon juice. Tip: Sabudana khichdi can be served with curd or as is. Add grated coconut for garnish.You can also add boiled potatoes to the khichdi.